Regina Kaufman, PT, EdD, MS, NCS is Professor of Physical Therapy at Springfield College in Springfield, Massachusetts. 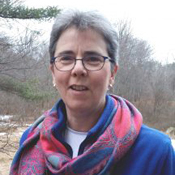 She received her bachelor’s degree in physical therapy from Russell Sage College in 1984, an MS in PT from the MGH Institute of Health Professions, and an EdD from the University of Massachusetts, Amherst. She is an academician and clinician with a strong commitment to community-engaged education. For more than a decade she has partnered with community members living with chronic neurologic conditions to promote improvements in health and function while enhancing DPT student development through a variety of service learning initiatives. Long term relationships with community partners have prompted and informed deep introspection about what it means to provide authentic person-centered care as well as an evolving critique of some of the values and assumptions that drive traditional rehabilitation efforts. Through her description of a personal encounter with an acquaintance devastated by a stroke, Regina Kaufman,.. The Journal for the Humanities in Rehabilitation is a peer reviewed, multi-media journal using a collaborative model with rehabilitation professionals, patients and their families to gain a greater understanding of the human experience of disability through art, literature and narrative. The purpose of this interdisciplinary journal is to raise the consciousness and deepen the intellect of the humanistic relationship in the rehabilitation sciences. The Journal of Humanities in Rehabilitation offers a mailing list with periodic updates about new articles.